Crisp potato cakes are latkes with a pedigree. They’re easy yet elegant and are large enough to be cut into wedges. Which means no standing at the stove forever and frying a million individual latkes. 2. Boil the potatoes in a large pot of salted water until just tender, about 20 minutes, depending on the size. Rinse under cold water and peel. Let cool slightly. 3. Grate the potatoes lengthwise on the large holes of a box grater over a bowl. Add the onion, 1 teaspoon salt, and pepper and toss to combine. 4. Heat 1 tablespoon oil in a large (10-inch) skillet over medium-high heat. Add half the potatoes and spread to form an even layer. Reduce the heat and cook until the bottom is golden, about 12 minutes. Invert a large plate over the skillet and carefully invert the potato cake onto the plate. Add another 1 tablespoon oil to the skillet and gently slide the cake back in. Cook until the underside is crisp, about 10 minutes. Transfer to a baking sheet and keep warm in the oven. Repeat with the remaining potatoes and oil. 5. 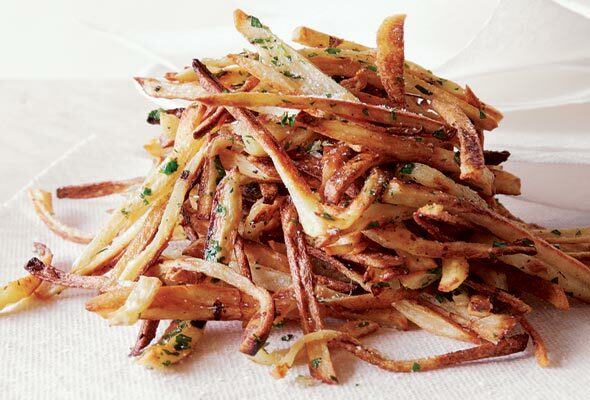 Cut the potatoes into wedges and serve immediately. This crisp potato cakes recipe was fantastic! The recipe offers major bang for the buck with just three ingredients (five, actually, if you count salt and pepper). This cake was, as promised, crispy on the outside and creamy in the middle. TIPS: Boiling the potatoes first is a stroke of genius; the potatoes are ready when you can pierce one with a paring knife and meet with little resistance in the centre. Do be careful, though, that the skins on the potatoes are kept intact when boiling—one of my potatoes was a little too waterlogged to grate properly. I also found that tossing the potatoes and onions together with my hands helped keep everything in distinct pieces—and you do want the potato shards to keep their shapes so that the various edges of the grated potato get crispy. I added the oil and potatoes to the hot pan, then waited the prescribed time before turning the cake over, but it wouldn’t budge. A few more minutes fixed that. I guess it’s just like searing meat, in that it will release from the pan when it’s ready. This crisp potato cakes recipe was a delightful version of a potato pancake. The exterior was crisp and browned, the interior light, moist, and fluffy. It just doesn’t get much better than that. I used a Yukon Gold-like, yellow-fleshed potato. I did add a bit more salt and pepper to the finished product, but my husband thought it was perfectly seasoned as it was. I could easily make a meal out of one of these when paired with a nice crisp salad. 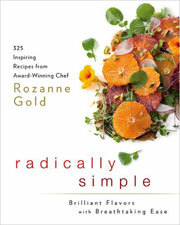 Crisp Potato Cakes Recipe © 2010 Rozanne Gold. Photo © 2007 woodleywonderworks. All rights reserved. All recipes and photos used with permission of the publisher. This latke recipe is a departure from what I am used to, but I am going to try this tonight. I like the idea of one or two large latkes instead of flipping individual pancakes. Glad you’re going to try it, Jamie. And I think you’ll be quite pleasantly surprised by the really ethereally light texture of the interior in contrast against the crisp exterior. It’s a simple but brilliant technique that the recipe relies upon. And so lovely any time of year. We’re honored that you’re giving Leite’s Culinaria your trust this evening. And, assuming that you’re making these “unorthodox” latkes in celebration of the holiday… Happy Hanukkah to you. (If not, as Renee says, the latkes are lovely any time of year, for any occasion.) Thanks for commenting. I don’t celebrate Hanukkah, but I’m going to show my support of the Jewish faith by eating a skillet full of fried potatoes tonight. Mazel tov! That makes two of us, Martha. Mazel tov! Good morning! I made the recipe and found it to be too bland. Having had the “traditionsl” latkes forever, I thought that I would try them. I served the cakes to the attendees of my Hanakkah party. Everyone agreed that they just weren’t to their taste! Tasted too much like mashed potato cakes was the most heard comment. This is not meant as a bad review. The end products was totally edible. Wishing everyone a happy and healthy holiday season!!! Mark, many thanks for sharing your experience, and we’re really sorry to hear that they’re not more to your liking. True, the taste is subtle, as these are more about texture with the crisp exterior and the mushy-in-a-good-way, mashed-potato-like interior. We do test each recipe several times before we decide whether or not to put it on the site, so I hope you’ll try another recipe (or three!) from us soon…. 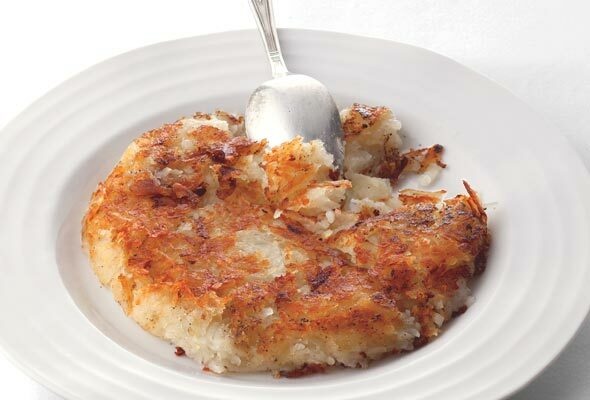 These are pretty much classic Swiss Rösti (Roesti) –.pronounced “rush-tea.” Traditionally they are cooked in butter or a flavored fat such as goose fat, which will give them more flavor. Most Swiss recipes that I have seen suggest chilling the cooked potatoes several hours or overnight before coarsely grating them into long shreds. It’s much easier to grate a chilled potato.